Much of what the president told delegates in New York was “directly on point,” said the Los Angeles Times. The U.N. should do more to address violations of human rights and national sovereignty by the authoritarian regimes in Pyongyang, Tehran, and Caracas. But the president’s message was undermined by his “needlessly offensive” tone and “juvenile” insults. Threatening to annihilate an entire country of 25 million people; describing Iran as a “rogue state whose chief exports are violence, bloodshed, and chaos”—this “guns-blazing rhetoric” may sound tough, but it achieves nothing and is in fact counterproductive. It used to be international “pariahs” like Libyan leader Muammar al-Qaddafi and Venezuela’s Hugo Chavez who spouted “hateful nonsense” to the General Assembly, said Ryu Spaeth in NewRepublic.com. Now it’s the president of the United States. If Americans ever wondered what it’s like “to be led by a wild-eyed megalomaniac,” now we know. The Trump doctrine, if there is one, is “intellectually confused,” said Fred Kaplan in Slate.com. 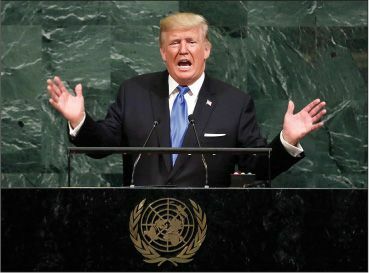 He claimed every government should respect the “national sovereignty” of other nations, yet in the same breath threatened North Korea and Venezuela. He chided Cuba and Iran for human-rights violations, but “said nothing about the similarly dreadful records of Russia, Saudi Arabia, or Turkey.” Why? Their leaders flatter him. Let’s be fair here, said Jonathan Tobin in NationalReview.com. Every recent U.S. administration has “made exceptions for authoritarian governments it needed to work with.” They’ve also all promised to defend America’s interests “against aggressive rogue regimes.” The truth is, for all the “huffing and puffing” over the “shocking” language in Trump’s speech, the substance was “remarkably similar” to that of his predecessors.